I told you! Did I tell you? Yes I did! The greens are the best part. And you don't have to remove the stems, either. Is all this Beet Talk driving BO crazy? 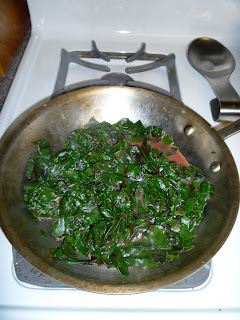 K-I just looked back through my blog comments and saw that you did suggest eating the greens on January 17. I'm so sorry I wasn't paying attention, especially since the greens are *A*mazing. D-Two of the best combinations: butter & garlic, and peanut butter & chocolate. M-Actually, BO liked the cooked greens. You should try cooking them sometime. Beet sales would skyrocket if they'd just market it as "Two veggies for the price of one." A little while ago I was looking for a berry recipe when I came upon one for Quinoa Soup with Beets and Beet Greens; how's that for a weird coincidence? I love quinoa (high in protein and low in fat) and might make this before I move on to the Beets with Crumbled Feta (thanks for that suggestion). I will have to try the greens too. I heard the same thing the next day after we went shopping.